The Cadillac ATS is the automaker’s luxury compact sedan, that features seating for up to five, and an interior that exceeds all expectations. The ATS is engineered and produced by General Motors, and is manufactured in the United States, in Lansing, Michigan. The Cadillac ATS is the smallest offering in the luxury brand’s lineup, sitting just under the Cadillac CTS for size. The ATS made its debut in the United States in early 2012, and has been selling here and overseas ever since. The 2015 Cadillac ATS sedan received various updates for its newest model year, ranging from interior changes, to exterior revisions. The 2015 ATS also feature three advanced engine options, and an impressive array of other technology that ensures the utmost performance from the compact sedan. With all of the impressive updates, technology, and engine options added for 2015, one of the most interesting changes for this model year is the addition of the ATS Coupe. This two-door version of the ATS features a wider front and rear than the sedan, and has other great features for the sporty coupe style. One of the first changes made to the 2015 Cadillac ATS may not be noticeable to some drivers. The Cadillac badge that sits on the front grille of the ATS goes wreath-less for 2015. The new badge design drops the old wreath image, for a more modern look. Aside from this small, yet significant change, the 2015 ATS also underwent various other changes for its newest model year. Aside from the new badge, the front end of the ATS features a new styling that leaves the compact car feeling even more luxurious. With a newly redesigned grille, and wider front fenders, the 2015 ATS takes on a more substantial stance, and a striking first look. Drivers are also able to choose from two new exterior colors for 2015, including Crystal White Tricoat, and Dark Adriatic Blue Metallic. 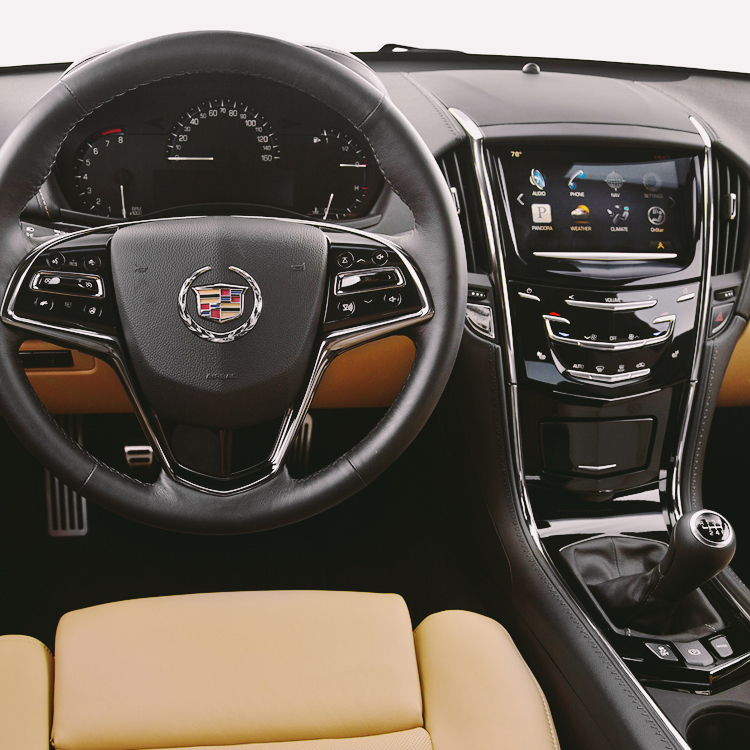 The interior of the 2015 ATS received minor changes, including new interior color and trim combination options. Technology-wise, the 2015 ATS is incorporating OnStar 4G LTE connectivity with built-in Wi-Fi connection, to help drivers and passengers stay connected on the go. A unique Powermat wireless phone charging dock is also built into the new ATS, for maximum convenience. Cadillac’s CUE infotainment system is also standard on the 2015 ATS, which includes text message alerts, and talk-to-text technology. The ATS includes passive entry as a standard feature on all models, as well as a tilt and telescoping steering column on Premium trim level models. Minor updates for 2015 safety features on the ATS include a lane change alert system, and a lane keep assist system, both of which are added to optional safety package available for 2015. The 2.5-liter engine that delivers 202 horsepower, features just enough power, without going overboard. This engine gets an EPA-estimated 21 miles per gallon in the city, and 30 miles per gallon on the highway. The 2.0-liter turbo engine features 272 horsepower, and delivers 295 lb.-ft. of torque. This engine is perfect for those that want impressive power, but who also want to stay grounded. This higher performing ATS gets improved fuel economy, with 21 mpg in the city, and 33 mpg on the highway. The 3.5-liter V6 engine is the ultimate in power, precision, and performance. This performance-driven engine gets a staggering 321 horsepower, that allows for the fullest experience behind the wheel of the 2015 Cadillac ATS. Drivers can expect a fuel economy of 18 miles per gallon in the city, and 28 miles per gallon on the highway. The 2015 ATS sedan features other performance-driven elements that further elevate the overall driving experience. Limited Slip Rear Differential - This available technology helps by delivering the right amount of power and torque to the wheel, for added confidence on the road. Brembo Front Brakes - These high-performance front brakes feature the ultimate in stopping power. The consistent pedal feel while braking, gives drivers added confidence when fast braking is necessary. Magnesium Paddle Shifters - Drivers can effortlessly change gears without taking their hands off the wheel. Located right behind the steering wheel, drivers will have added control over their ATS, and have more fun while doing it. Magnetic Ride Control - A class-exclusive technology reads surface conditions 1,000 times per second, and adjusts the damping for added handling, and control. Drivers can choose from Sport and Tour driver-selectable modes for even more customization. Five-Link Rear Independent Suspension - This high-performance independent suspension helps the ATS sedan stay firmly on the ground, even during advanced driving maneuvers. The brand new ATS Coupe is a welcome addition for 2015. The coupe version of the ATS sedan features many of the same elements, with a few differentiations. To start, the coupe is only offered with two engine options - the 2.0-liter Turbo, or the 3.6-liter V6. The most noticeable difference comes from the model name. The ATS sedan is a four door version of the compact car, while the coupe offers drivers a two door option. Because of its two door configuration, the coupe offers its driver and front passenger a bit more room up front - by about two inches. Both versions of the ATS offer the same amount of rear leg room. Another major difference between the two body styles is the starting MSRP. The sedan version of the 2015 ATS starts at just $33,215. The 2015 ATS Coupe comes in over $4,000 more expensive, with a starting MSRP of $37,995. Both the 2015 Cadillac ATS sedan and coupe are exceptional compact cars, with luxury amenities, quality craftsmanship, and a dedication to perfection.